If I eat crap, I feel like crap. So I eat to stay healthy and energized, and to help me keep the fibroflares at bay. 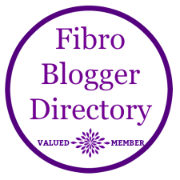 As with most chronic conditions, fibromyalgia symptoms and treatments are not a one-stop shop. No two people are alike in how their bodies react to the condition or to treatment. The thought of using food to heal oneself has been around for centuries, yet many people still reach for the over-processed, low nutritional value, fast foods – either from the grocery stores or eating out. I, myself, am hypersensitive to medications, so I have chosen to manage my condition through lifestyle choices, such as diet and exercise. But just as no two treatments are alike, neither are the foods one should eat. A simple search for books on Amazon of “fibromyalgia diet” yielded 655 results, with this one being the most popular! But there are common foods that are more likely to trigger a reaction or flare and others that are good for reducing inflammation in the body. I offer some suggestions on finding what’s right for you. Basic common sense says you should eat a well-rounded diet. But of course what that means has changed over time. We’ve gone through various iterations of food pyramids, squares, and round plates to teach us what we should and shouldn’t eat. It’s no wonder we can become confused about what to eat. I pack my own lunch and do cook at home most nights of the week, and I follow something like this food pyramid from Dr. Weil that takes an anti-inflammatory approach. Eating foods you find in nature is the best approach, whether it be a keto, Mediterranean, Virgin, or Paleo plan. Your plate should have many colors from the rainbow! I find it best if every meal contains some substantial source of good protein. Eat for energy by eating things like almonds, nuts, and seeds; beans; tofu; oatmeal; dark leafy greens like spinach; and avocados. A handful of raw almonds in between meals will usually keep me going. Eat to reduce inflammation and pain by eating things like pineapple, figs, berries, broccoli, flaxseed, chia seeds, kale, walnuts, buckwheat, peppers, mushrooms, ginger, turmeric, and salmon, and drinking green tea. I strive for a 90/10 rule when it comes to my diet. I am good 90% of the time. But I do eat meat, I limit myself to 1-2 cups of coffee a day, and I have the occasional glass of wine or dessert. And if I overindulge, I am sure to pay for it with a flare. So it’s just not worth it. I have also gone through some elimination diets to see what triggers a bad reaction in me. This is why I avoid dairy, soy, gluten, and sugar. If you have a lot of digestive issues or notice you feel bad after eating, you should try to keep a food diary and then try an elimination diet as well. Omega 3 Fish Oil to help to reduce inflammation. Calcium + Vitamin D to help ward off nighttime leg cramps. Without this I wake up screaming in pain during the night. I do still get them occasionally, but not nightly. Magnesium Malate to reduce pain. I have written previously about how Magnesium Malate has helped me. My doctor recently told me if it works, keep taking it. There have been two occasions where I missed a night, and the pain returned in my right shoulder and arm. This exact brand and strength has helped tremendously with pain relief, and hasn’t caused any stomach problems for me, and I will not stray from it. Probiotics to help with digestive issues. There are so many different brands and types, but lately I have been buying the Jarrow brand from my local store (they have to stay refrigerated) – this was recommended by my physical therapist. Digestive issues are common with my fibromyalgia, and without some sort of probiotic I experience painful symptoms of bloating and gas. Vitamin C – I will boost my immune system at times when I feel something coming on, either with Chewable 500 mg Vitamin C or with drinkable Emergen-C. I have said for years that If I eat crap, I feel like crap. So I eat to stay healthy and energized, and to help me keep the fibroflares at bay. Do you have other healthy eating tips to share? Thanks for sharing some great information Cynthia! Pinning this on my Healthy Eating Information board.